The Seattle-based firm designed a concept for a new kind of public transit system that encourages people to ride it. Having grown up in New York in the ’70s, public transportation holds a special place in my heart. I can fondly recall the dilapidated state of subway cars and platforms in the mid-’70s. The sight of teenagers catching free rides off the back bumper ledge and that uniquely urban rite of passage: taking your first unchaperoned ride on the unwieldy system. Having now lived almost half my life outside of that city, I’ve had ample opportunity to test public transit in any number of locations, and one thing that never fails to impress is a smart, well-thought-out piece of public transit. Public transit is a social contract–not just between the system and its riders, but also between a municipality and its residents. A good system, no matter how modest, is the hallmark of a strong civic sensibility, not to mention a collective sense of place. With more and more of us opting to use these systems, the benefits and challenges of building, operating, and maintaining them present a design brief perfectly in pitch with our times; elegantly wedding issues as diverse as sustainability, system planning, and customer experience. Traffic 2.0 is an attempt by our firm, Teague, to reconcile these moving parts. At the outset our team, spearheaded by Brian Conner and Brian Monzingo, wanted to create a bus stop that, by virtue of its design, could help attract new ridership to urban transportation. After considering a range of preliminary solutions–each of which took on a different dimension of the problem such as construction costs, material selection, power, and general maintenance–it became obvious that no matter the intelligence, elegance, or general “wow” of its design, a bus stop is simply not a place any of us want to be at any longer than necessary. It also became especially evident that elevating the bus stop into a destination represented an abdication to the central problem of urban transit: the need to wait. Public transit is first and foremost about getting somewhere. Anyone who has traveled overseas knows the simple pleasure of successfully navigating a transit system in a country that would otherwise render him or her illiterate. Metroplan, an e-ink enabled system map, is our concession to this problem. 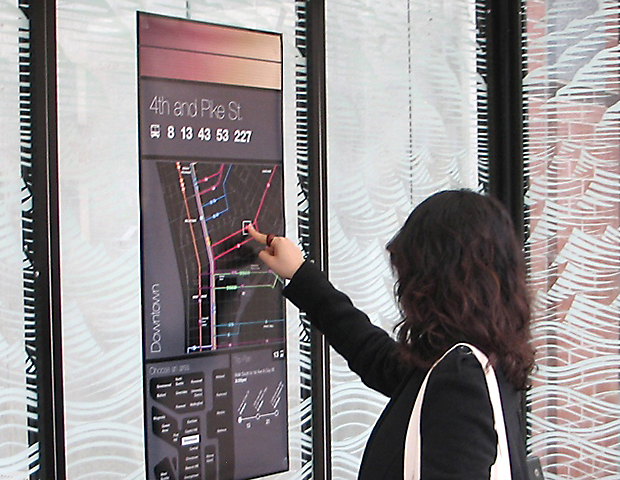 Powered by an embedded array of solar cells, the map is easily installed anywhere and is a snap to use. Passengers identify the general area of their destination, and a map (of that area) is shown displaying all available transit lines. To make route planning easier for tourists (a large segment of ridership) passengers can choose to view the system in an icon driven mode similar to the city maps handed out at hotels and convention bureaus, making destination finding easy. Once a route is found, an itinerary is calculated, complete with walking directions to the first stop. A transit card is a cool thing. It says you’re hip, civically minded and inclined to do the right thing. But unfortunately these cards seldom celebrate themselves. For Traffic 2.0 we wanted the card not just to be an integral part of the system; we wanted it to be a thing of desire and a badge of honor. 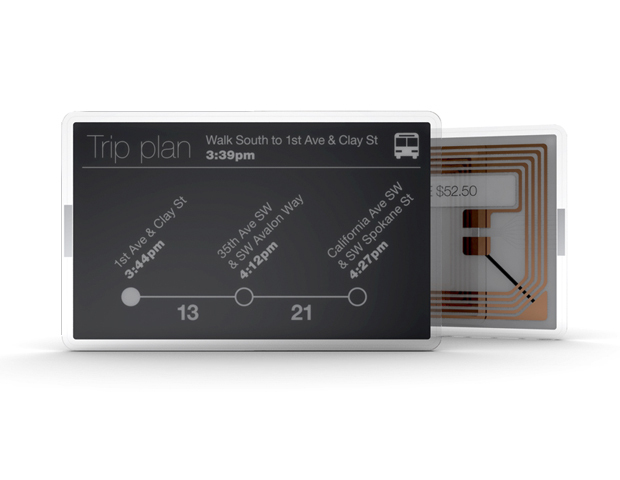 Metropass, with its e-ink display and visible RFID antenna, is meant to arouse curiosity, spark discussion and encourage pride of ownership; ideally attracting new users (revenue) in the process. The decision to incorporate e-ink into the pass came about as the team debated the benefits of using smart phones as payment systems and schedule keepers. Ultimately, wanting the system to have broad appeal, and recognizing that not everyone the world over has or can afford a smartphone; the decision was made to bring that convenience to the system through the card itself. Powered by RFID, the display lasts indefinitely and brings an extra level of value and functionality to the device. Touching it to the Metroplan migrates your planned itinerary to the card providing a convenient reference for route stops and transfers throughout your trip. But what about the wait? Responding to rider complaints over time wasted waiting for connections and arrivals, Metropoint tackles the problem of waiting right at its source, the bus stop itself. 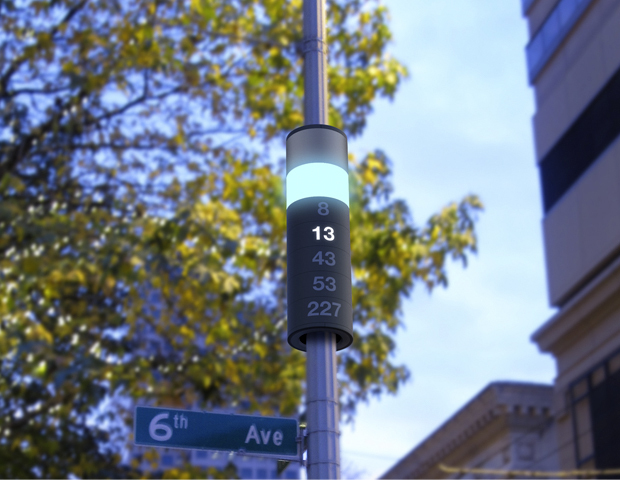 Available as a freestanding element as well as an add-on to existing light and utility poles, Metropoint provides riders information about bus arrivals within a 15-minute window. Readable from up to 150 feet, Metropoint gives control back to riders, freeing them from the tyranny of the stop and empowering them with the means to decide how best to use their time. Why 15 minutes? In most urban settings, 15 minutes is sufficient to allow passengers to bypass the stand and support one last errand, or, at the very least, make an informed decision to “wait it out.” A quick glance tells riders which routes are en route and which aren’t. If the route number is illuminated, but the top portion is not, the bus is more than 15 minutes from arriving at the stop. As the bus draws closer, the top portion of the unit illuminates: One band means the bus is 15 minutes out. Two bands, 10 minutes out. When the bus is less than five minutes away–bingo!–the full “hourglass” and route number flash, informing passengers that arrival is imminent. Sometimes a bus stop is just a bus stop. At the heart of Traffic 2.0 is a design solution we believe is a harbinger of things to come: a design solution that seeks to improve upon its surroundings rather than dominate them. Design long ago mastered the art of coming up with “the new”; the problem is that the cadence of “the new” is increasingly at odds with “the now.” We cannot create our way out of every problem, at least not entirely. With Traffic 2.0 the team chose to leverage what was already there–partly in a nod to the economic crisis and partly to define a restriction within which to work. 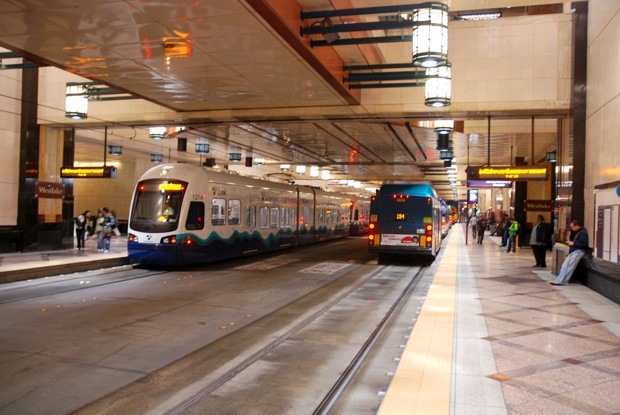 According to the American Public Transportation Association, there are over 7,700 urban transit systems within the U.S, most of which are composed of bus or light rail systems. In 2009 alone, these systems handled over 10.2 billion trips. Before we rush to replace them, can’t we reclaim some through better orchestration of existing infrastructure? It may not bring the rush of blood to our heads that starting anew does, but it just might be the right thing to do. Tad Toulis is the creative director of Teague’s Seattle-based design studio. Prior to joining Teague, he worked at Lunar Design, Motorola’s Advanced Concepts Group and Samsung’s LA LAB. Tad is a regular presenter and lecturer, speaking to the topics of design and business at events, universities and conferences across the globe. His contribution to design has been honored with numerous awards including the Red Dot, IDEA, Good Design and iF awards. Tad was also founding member of designRAW, a San Francisco-based design collective.